This entry was posted on January 12, 2012 by Sports Traveler. The college bowl season has come to a close and in just a few weeks the Super Bowl will mark the end of the NFL season. This is the part of the year when the sports world turns its attention to basketball. The NBA usually hits full stride this time of year and college hoops are in the midst of the conference schedule. It will be half a year before we crown an NBA champion but a new college national champion will be cutting down the nets in just a short few months. As we move closer to March you can already start to see teams really go at it. With great in-conference match-ups, the remainder of the season should be an absolute treat to watch. 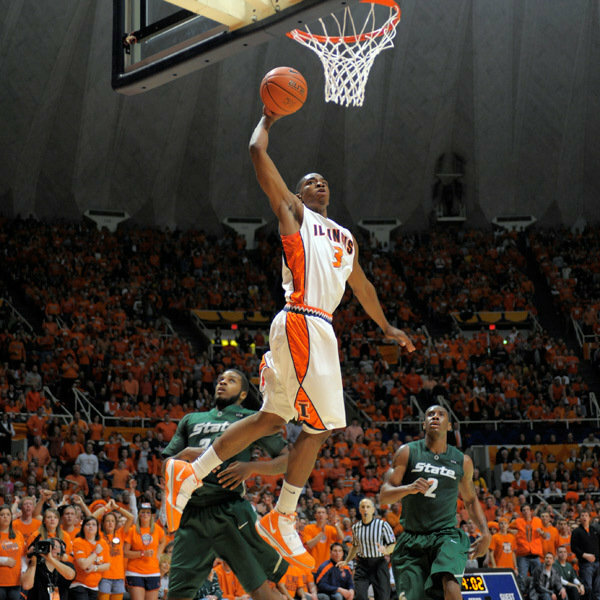 Take Brandon Paul's performance from the Illinois and OSU game this week as a notice that March Madness is coming! If that doesn't get the blood pumpin' folks then check your pulse. This is just the beginning. In 2 months the road to the Final Four begins with the greatest championship tournament in the world. This year the Final Four comes to the Mercedes-Benz Superdome in New Orleans, LA. Take a trip to the "Big Easy" and be there for all the incredible action as 4 teams battle for the right to called a national champion. Sports Traveler wants to make your Final Four trip a reality. We currently have great deals on tickets and fully accommodating travel packages. Our travel packages can feature comfortable lodging, tickets to all 3 Final Four games, motor coach transportation to and from the venue, access to an exclusive cocktail party, and so much more! The culmination to the "Big Dance" is the icing on the most delicious cake in the world. Who will get their cake and eat it too?